WILLIAMSBURG, VA – Everyone knows, milestones aren’t really worth much unless they really signify something special. After all, age is just a number when you’re talking about most things – and especially in the case of a golf course. 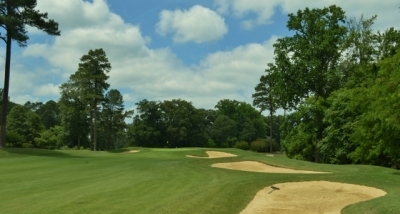 But one of America’s classic layouts turned 50 years old this year – and that means the Golden Horseshoe Golf Club’s Gold Course has been pleasing folks for half a century. It’s definitely an anniversary worth celebrating. 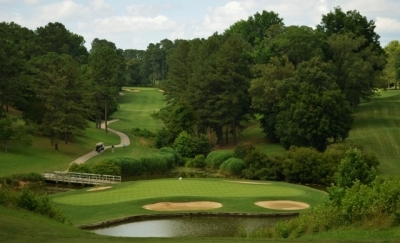 The course itself is not quite the same as the one that opened for business in 1963 (note: the club is celebrating the anniversary all of 2014), a layout that legendary golf architect Robert Trent Jones called ‘My finest design.’ It was decided in the mid-90’s that the layout needed a few alterations in order to make it a little more friendly to the average resort player. 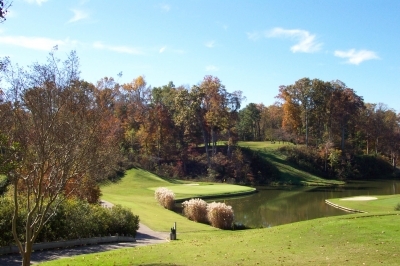 Set on a peerless piece of land, the course had garnered a reputation for being difficult – which isn’t always desirable when its main function is to entertain resort guests. At 498 yards, the par five 2nd hole is definitely reachable -- but you'll have to clear 50 yards of water to get there. 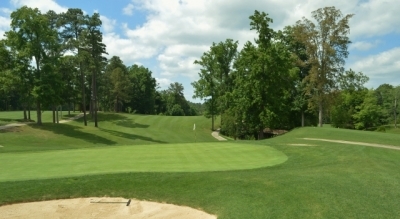 The late Del Snyder, the Golden Horseshoe Golf Club’s Ambassador of Golf and long-time friend of golf legend Sam Snead, said “Sam only played this course once, and he said it was too difficult to be a resort course.” As a result of Snead’s and others’ similar opinions, Trent Jones’ son Rees was brought in to make some changes. “And I’d already done a lot of Robert Trent Jones re-dos – so when they got around to considering an upgrade for the Gold Course, bringing it up to modern technological standards, they asked me to work for them because they really liked what I’d done with the Green Course,” the younger Jones said. One of the toughest holes you'll ever face, the 435-yard, uphill the whole way 17th hole. It's an intimidating tee shot, too. It probably didn’t hurt that Rees’s foreman, Austin Gibson, had not only built the Green Course, he’d actually done the original construction work on the Gold Course project back in the early sixties – and would be coming back again to finish the task in the nineties. There was a continuation in tradition as well as knowledge when it came to the Jones family name – and when you’re talking about a traditional, historical place like Colonial Williamsburg and the Golden Horseshoe, that’s a giant step towards getting the job right there. Bridging the lake to the par three 7th hole's green. Jones said his dad didn’t have any involvement in the ‘new’ work on the Gold Course, since he was pretty elderly at the time. But the son also kept his father up to date on what was being done, and the senior architect gave his approval. How’s that for a continuum? From in back of the par three 3rd hole. Not much margin for error on this one, as there's water in front, slopes to the sides, bunkers to avoid and one heck of a sloped green. No doubt, a good choice. Trent Jones took what was already there and created one of America’s truly classic golf designs. Having seen a fair number of private clubs with established reputations, they haven’t anything on the Gold Course in terms of beauty, playability and quality of design. Simply put, it’s one of the best and most enjoyable golf courses anywhere. 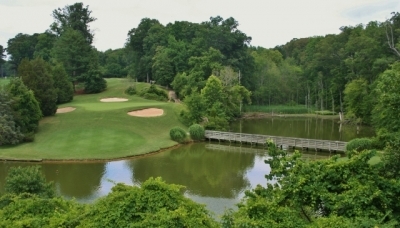 Most of the old nine-hole golf course became what is now the Spotswood Golf Course, a nine-hole executive course that remains a favorite of the Golden Horseshoe’s local members. And if you stay at one of Colonial Williamsburg’s hotels, you can play there, too. 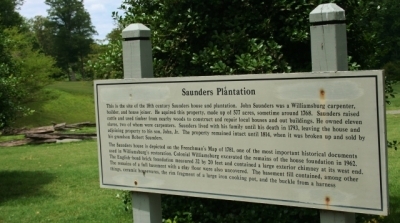 The land that the Gold Course now occupies used to be the Saunders Plantation. History, history, everywhere. 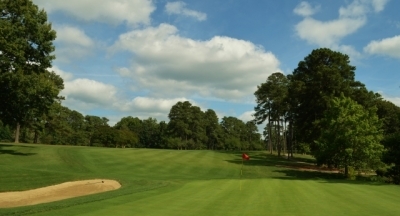 Like nearly everything at Colonial Williamsburg, the land that the Gold Course occupies was at one time something else – in this case, the original site of the John Saunders Plantation – an 18th century farm that encompassed 577 acres. Colonial Williamsburg excavated the remains of the original house foundation in 1962. Try as you might, you can’t get away from the historical significance of the place. With that in mind, Rees Jones and the Golden Horseshoe management closed the Gold Course (it re-opened in July of 1998), intent on changing the course only in ways that would make it better. Even the short holes are still difficult on the Gold Course. Here, in back of the par four 13th hole. “In the old days, they had to build greens and tees and use the lay of the land as it existed, much like in the British Isles. Now, with the amount of play the Gold Course was getting, we wanted more visibility into the greens – because there aren’t caddies – and you really need to see the targets better. We kept the green sizes and orientations as they were, but also added some tongues – championship hole locations for tournament play,” Jones added. Jones said they decided to eliminate some of the fall-off qualities of the greens because they were already pretty small, and they added contour on some greens and flattened some others, all with the idea of increasing playability. They also deepened the bunkers. Along with the golf course strategic improvements, Jones and crew also installed a state-of-the-art irrigation system and paved the cart paths all the way around. These are the types of things you don’t really think about when playing at a place like the Gold Course, but they’re essential for maintaining the outstanding course conditions that you’ll find there. On every hole on the Gold Course, the visual frame is there for you. Looking at the par four 8th hole. Jones said he merely did what his father would have done thirty-five years earlier, if he’d had the technological advances available to him. The son’s sensitivity to his father’s classic creation only makes the Gold Course more special, and you can sense that when you’re out there playing it. “Everything’s natural, there are no houses, and the ravines come into play throughout. Along with the lakes, the topography is extraordinary,” Byrnes expounded. It's all downhill to the par three 12th hole. The tricky wind over the lake makes club selection extra difficult. Normally we’d try and filter out, or soften, statements like that. But for the Gold Course, that’s dead-on accurate. Well said. The exacting nature of the course will frustrate you – it’s one of those where you really think you should be scoring better than you are. But never once do you regret being out there, because it’s that great an experience. The par five 6th hole is certainly reachable in two for long hitters -- but accuracy is a must. 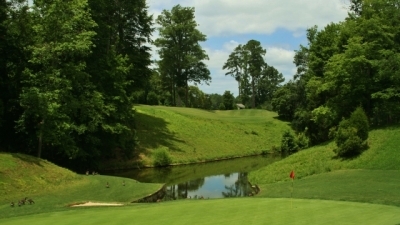 The star of the show is the sixteenth, a 169-yard, steeply downhill tee shot to an island green. It’s the one shown on all the photos, and the one that’ll remain etched in your golf mind, long after you’ve hit the road. You've seen it before. The par three 16th hole. You'll want to see it again... and again. Thankfully, it’s a big island – but be careful of going long. 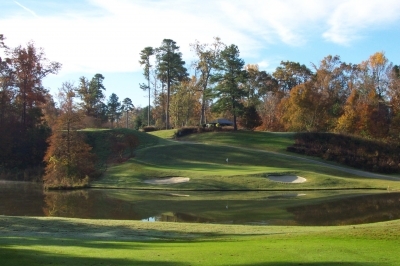 The same body of water surrounding the sixteenth also figures into three other holes – the par five second, and two more of the Gold’s great par threes, the seventh and twelfth holes. Put together, it’s a panorama of golf that’s virtually unmatched, to enjoy the game of golf in such a natural setting. As a side note, there’s also a 634-yard par five, the fifteenth. We didn’t ask Jones if that was the longest par five at the time, but even now, it’s a gritty test of strength to reach it in regulation. 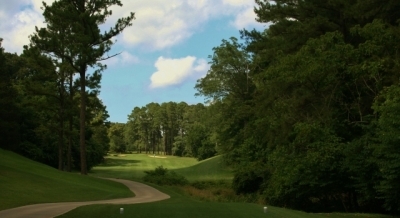 Closing out the round on the par four 18th hole, you will be planning your next visit before you leave the green. It’s proof positive that some changes, even to a classic, can only turn out for the better. And 50 years later, the Gold Course is a place you just want to be. Check it out for yourself. 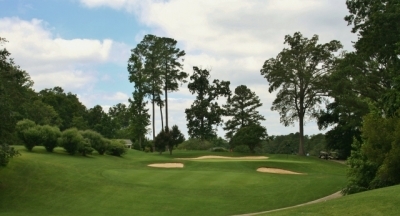 As part of Colonial Williamsburg, golf at the Golden Horseshoe is available through a number of attractive package rates, which vary depending on length of stay and type of hotel accommodations. We suggest checking the web address above for more information.